Motor coupler broke. Unplugged the washer and raised it up on automotive jack stands. Pried off clips to loosen water pump. Removed screws and clips to loosen motor. Removed three bolts that hold the gearbox assembly to the stuff above it. This allowed it to drop down and twist so I could easily remove the pump and motor. Removed old coupler and replaced w/new. Re-installed motor and water pump. Then, I was unable to raise the gearbox assembly back high enough to re-thread the three bolts. It’s about half an inch too low for the bolts to thread. Hoooold on there, Bubbalouie! This is one of the easiest repairs in the whole appliance universe. All you gotta do is remove the cabinet, pop off the pump and motor and, budda-bing budda-boom, you’re right there at the coupler! This is a 15-minute repair even if everything goes wrong! Compare our grasshopper’s report with the elegant simplicity of doing it the right way. Whatever became of our hoodooed grasshopper and his star-crossed washer? You can read all about his current mis-adventures here. 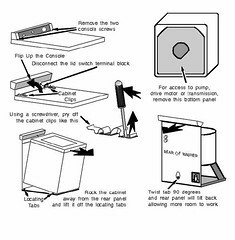 This entry was posted in Washer Repair on March 30, 2006 by Samurai Appliance Repair Man.